It’s late seventeenth-century Scotland, and the clans are a-feudin’. This film has two matinee-idol lookers for stars in Larry Parks and Ellen Drew, and if you guess that means we’re in for a cross-clan Romeo and Juliet-type romance, well now but you’re good guessers, lads and lassies, aren’t you? The Glowan and MacArden clans have been stealing each other’s livestock and cutting each other’s throats for a century, but when Alexander MacArden (Parks), calling himself “Donald Fraser,” cute-meets Barbara Glowan (Drew), bonny eyes start a-twinklin’, and young Alex vows it’s time to make peace between the clans. Under his false name he attends the Glowans’ highland games, winning the javelin throw (tossing an eight-foot boar-sticker—some javelin!) and Barbara’s heart. But he’s recognized as a MacArden and the killings, fair duels and foul murders, begin. I’ve never quite understood Parks’ appeal, and at first glance Drew doesn’t do much besides smile and look adoringly at Parks, but I admit that they both eventually show enough depth to win me over. I have no such reservations about George Macready as Barbara’s villainous cousin Robert Glowan, who’s as much for war as Alexander is for peace. He’s nasty and smart, manipulating his younger brothers into dishonor and death, and he’s always quick to go for his basket-hilt broadsword. 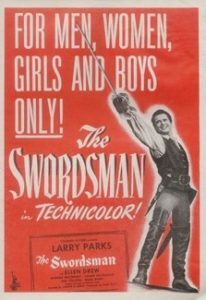 But Alexander, though reluctant, is a dab hand with a broadsword himself, and as you might expect from a film entitled The Swordsman, blades flash with some frequency. The swordplay is good, too, and the lead Glowans and MacArdens, Parks included, are all credible fencers. This is a handsome production that makes good use of Technicolor. Northern California stands in for the Scottish Highlands, and it’s scenic enough for the part, especially with the addition of a few herds of sheep and some judiciously-placed matte paintings. The cast’s Scottish accents are hit or miss, but at least there are only a few golf and whisky jokes. Given this tale’s series of abductions, ambuscades, betrayals, and warnings of betrayals, there’s an awful lot of riding along the shores of the “lochs,” all conducted at a gallop—I swear, there must be a full fifteen minutes of sheer galloping in this flick. Plus these haughty Scots are stiff-necked and proud, which accounts for all the misunderstandings in act two. But by act three everyone’s decided whether they’re for war or peace between the clans, which leaves Parks and Macready to sort things out in a fine rough-and-tumble climactic duel. Will peace and love prevail in the end? Geez, what do you think this is, a Shakespearean tragedy?